In FY2017, 30 companies were awarded over $1 million to train 968 new and incumbent employees in the Michigan Works! Southwest area. Our Business Services staff here at Michigan Works! will sit down with employers to determine if a training program can help fill gaps in your job recruitment needs. We consider your needs, the availability of training partners, and the possibilities for multiple funding sources. 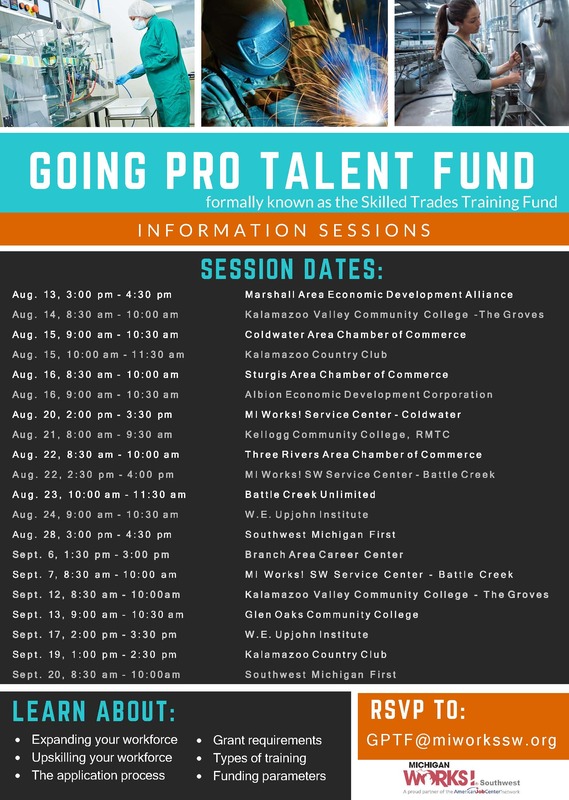 The Going PRO Talent Fund awards employers with assistance in training, developing and retaining current employees and individuals to be hired. Employers with a need for skill enhancement, including apprenticeship programs and advance-tech training programs for current employees or individuals to be hired, may be eligible to apply for the Going Pro Talent Fund. Training programs are customized to the needs of each employer, allowing them to either promote from within or to train and develop skilled workers. Designed to be completed quickly, trainings usually last less than 3 months, and are completed in less than 6 months. Employers are expected to be active in designing the training, and when completed, workers receive a credential for a recognizable and transferable skill. Work with our Business Solutions Professionals to determine if Going PRO Talent Fund grants are appropriate to help fill the skills gap at your business. For more information about the Going PRO Talent Fund (formally known as the Skilled Trades Training Fund), review the Program Overview, Fact Sheet, and Frequently Asked Questions.